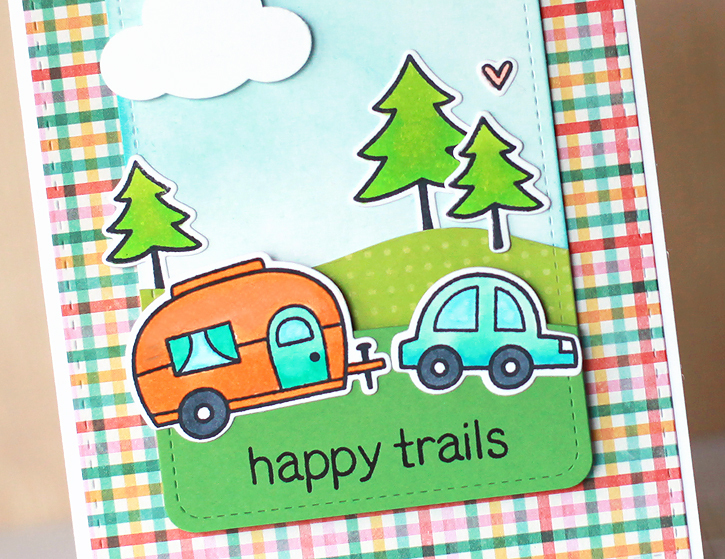 The Lawn Fawn Happy Trails stamp set is one of their older ones, and one of my favorites (although with so many cute stamps I have a lot of Lawn Fawn favorites!). 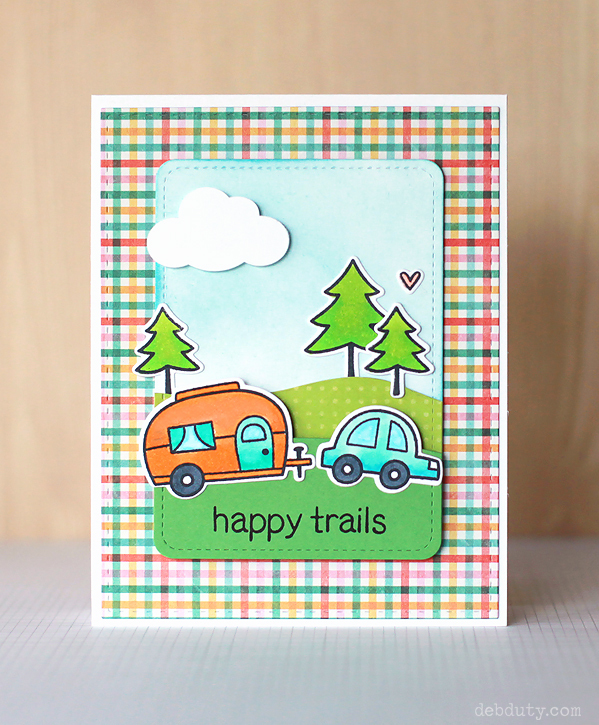 How cute is that adorable camper pulled by that little car?! I made a tiny scene with hills and trees and a sky for my card. Here are the steps for creating this card. The base is Neenah solar white 80 lb cardstock cut to the standard A2 size. The patterned paper panel is slightly smaller, cut with the Simon Says Stamp stitched rectangle die. I cut a card out of white cardstock with the Lawn Fawn stitched journaling card die. I also cut a solid green (Bazzill lime crush) and a dotted green card with the journaling card die, but I only needed partial cards. I stamped and die cut my stamps, and punched out a cloud for my scene. Next I added curves to my green cards. I used a hills die on the green paper, but on the dotted paper I just sketched a hill in pencil and cut it with scissors. I used peacock feathers distress ink to add blue for my sky onto the white card. The ink was applied in a circular motion with my mini blending tool. 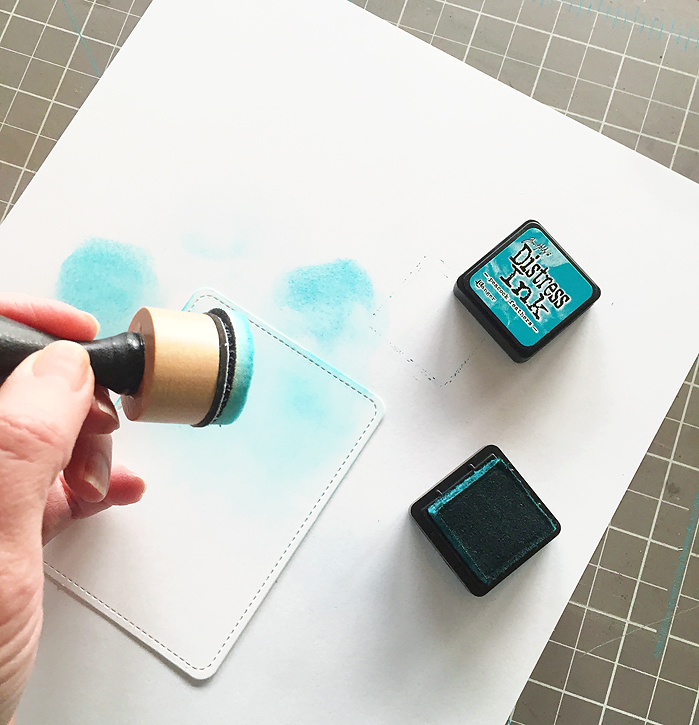 Be sure to start off the paper and blend toward the card for a subtle sky color. I then stamped my sentiment on the green paper and layered my hills onto the journaling card. The dot paper was adhered directly on the card, while the green hill was adhered with foam adhesive. I colored my stamped images with copic markers and arranged them on the card as shown, and I used foam tape to add the card to my card base along with the patterned paper stitched rectangle. The cloud was added with foam adhesive also. 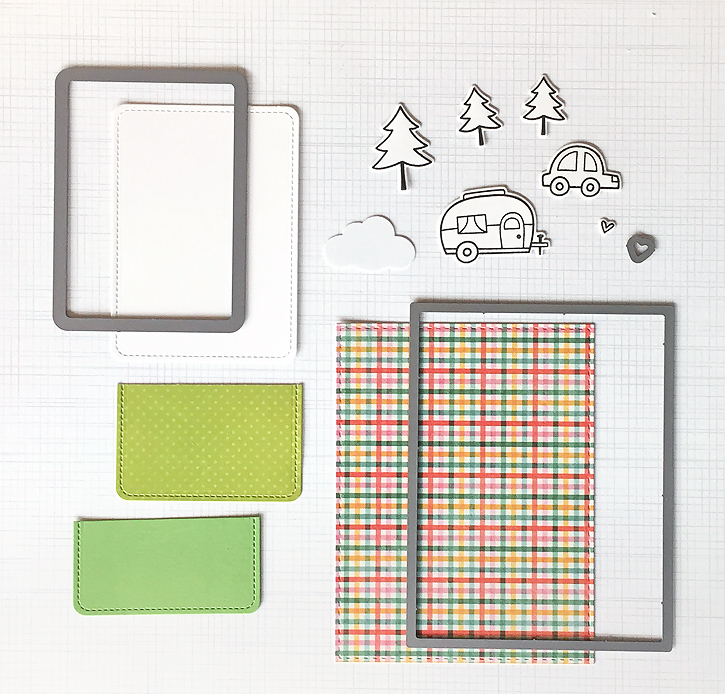 The patterned paper is from the Pebbles Lakeside collection. I really love the colors in this plaid! (I also used it on my Cool Day card). I was lucky to find the Lakeside 6x6 paper pad at TJ Maxx on clearance, but it's also available here. The supplies used in today's card are linked below. Have a lovely weekend! Great card and I love your tutorial! This is ADORABLE!! I love it! !